How am I writing a favourites post again?! September has gone by far too quickly and I can’t believe it’s October already!! Where is time going?! Any who without further ado these are the products I’ve been loving this month! I don’t usually pay this much for foundation but I bought this over a year ago and it has lasted me a long time as I only wear it when I go out on a special night out (for birthdays etc) as it has staying power without feeling too cakey. However this month I’ve had my birthday so I wore it when I went out for that and I’ve always had two weekends away in London I decided to try it for its all day staying power. It passed the test and did last all day without going patchy! It’s the first foundation I’ve tried that I’ve not had to use a buffing brush on following its application with a foundation/face brush as it smooths on first time. I am very impressed with this and I will be repurchasing it when it runs out but I will still save it for special occasions! I love Primark home it’s super cheap and nice and the products are of decent quality. This month I picked up these two gorgeous candles in winter scents for less than £2 each and this lovely canvas print complete with frame for only £3! Dry shampoo has been my lifesaver in this busy month! I picked this up at Superdrug on offer for about £3 because I’d heard good things about it. I really hoped someone would bring out an invisible dry shampoo as I don’t know about you but the whiteness of most of the ones on the market really bugs me! I didn’t like the scent of this as I think it smells like men’s aftershave but it does what it says on the tin and you can’t tell you’ve applied it plus it doesn’t dry out your hair! This baby was so hard to get hold off thanks to Zoellas recent video but when I did get hold of it I wasn’t disappointed! I reviewed it fully in another post but in summary this is a good set for a good price and it’s a decent size! It’s my favourite contour kit at the moment and I especially love the highlighter! This has revolutionised my lip routine! It takes two seconds to scrub on in the morning and leaves lips super soft and ready for a slick of lippy! The particles are so small it gets every area and you only need a tiny bit to do the job so it lasts ages. Plus the added bonus that it smells gorgeous! I only recently discovered this, see my full blog post here. I can’t believe I never discovered it before now! September has been surprisingly warm and this little gem has kept my oily skin at bay whilst keeping my makeup nice and fresh! It’s a nice and refreshing spritz too! This has been my go to perfume in September as its perfect for all my nights out and weekends away. It’s the perfect transition between seasons scent and the bottle is so cute and small enough to pop in my handbag for tops up throughout busy days! This one is a 40ml size and has lasted me ages so far. What have you been loving in September? Let me know in the comments! Oh this is lovely! 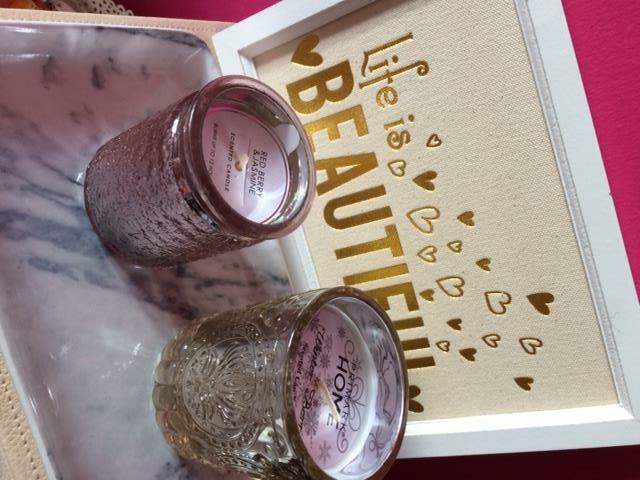 The candles are gorgeous and I will definitely be trying that Lush lip scrub! Have an amazing night and thank you for following my blog Sophie!! I can’t imagine being without that Colab dry shampoo now – it’s literally the only one with a smell that doesn’t give me a headache, and that doesn’t make me look like I’m going grey!